Just too many coming in. Don’t know how to categorize them. Is it news or a joke? Is it real or is there really a parallel universe? ‘Maybe neither God nor the Devil is in charge any more. 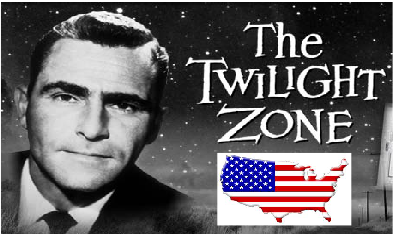 Maybe Mr. Rod Serling has taken over and everyday is a new episode…. The list begins. Each new ‘episode’ will be identified by a new post and listed on this page. All episodes are strictly American in origin. Some are also listed on the Weak and Stupid Page because of their relevance to Islam. Join The Food Stamp Army ? This Story Gets Better, or Actually Worse! IRS Giving Billions of Dollars Away to ILLEGALS Each Year! F__K America! – Judge Allows Butchers of 9/11 to Celebrate! The Democrats actually booed God at their national convention!! America’s #1 Whore/’Women’s Rights Activist’ Draws Crowd of 10! Barack Hussein Obama Elected for a Second Term! Federal Government & The AIDS Hypocrisy! SOLD – FOR ONE CENT!